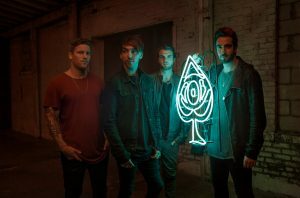 All Time Low: "This is our first time making an album in secret!" They’re always on tour and their new album, “The last young renegade” will be released on June 2nd! We’re talking about All Time Low: we’ve talked about the past ten years during their show in Milan, the last one of the European tour. Check it out what Alex and Jack said! Hello guys! Your new album, “The last young renegade” will be released on June 2nd. Can you tell something about the creative process behind it? Alex: Yeah, we worked on it all last year. I took some trips out to secluded places… I went out to the desert, I went up to the mountains for a little while. I wanted to get off the beaten path and not have distractions of everyday life and really focus on the music to figure out what this record was going to be about. I think that’s what helped come up with the story of the record: being able to disconnect and really get creative. Jack: Another thing about the creative process that was different for us this time is that this was our first time making an album in secret. We had just released “Future Hearts” so it was pretty soon to go back into the studio, but we just wanted to make an album without any outside influence, opinions: just the album we wanted to make. The two singles “Dirty Laundry” and “The Last Young Renegade” are very different from each other. Was it a choice to show the variety of the album’s sound? Alex: Yes, exactly! “Dirty Laundry” was a really different song for us to put out first, it really encapsulates the whole album, whereas “The Last Young Renegade” sets up the storylines that the record tells. So I think it was important to put out both first: one sums up the album sonically and the other one starts to tell the story. You’ve reached ten years of career. What was the most difficult moment for the band? Jack: Every time we released or recorded an album we had a plan, but this time everything was up in the air, so it was weird. Alex: Yeah, it was unclear, but it ended up being amazing, so no regrets! After ten years what’s the funniest thing about being on tour? Alex: The best thing about being on tour is getting to see the world! We get to meet a lot of cool people from all over the world and there’s something really special about that! You realize how small the world is and how similar we all are. After the album’s release will there be a tour? You’re always on tour, guys! Alex: Yes! We’re always on tour, that’s what we do! The last one: if you had to describe your band with the name of a drink, what would it be? Alex: … but it sounds right! “Under the Moonlight”, l’ottima prova solista di Ferruccio Fusetti!